I’ve been sharing quite a bit about coffee treats lately. Iced Coffee, Homemade Chocolate Frappe, Chocolate Whipped Cream for Coffee…yum. This is great for everyone except for those who don’t like coffee, right? Yes, well. This post should take care of that. So for all the “don’t like coffee” people out there, including my family, who thinks my Homemade Chocolate Frappe looks really good but tastes really bad – here’s what I’ve come up with as a delicious alternative. 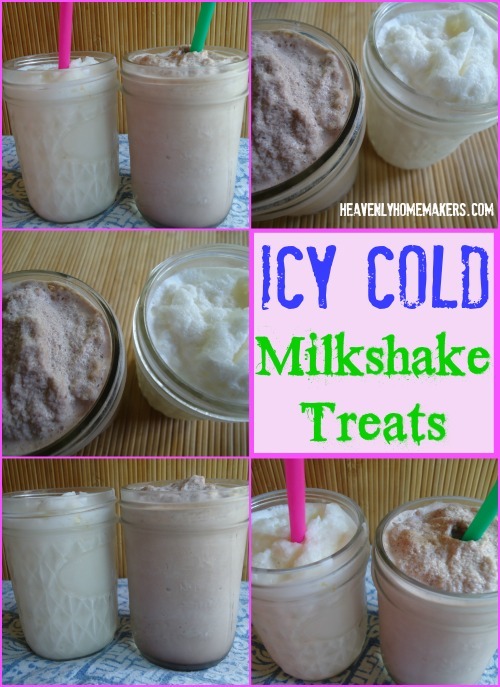 Icy Cold Milkshake Treats. Instead of starting out with coffee ice cubes, simply start out with regular ice cubes. Instead of adding cold coffee and milk, simply add cream and milk. Instead of adding chocolate…oh wait. We’re still adding chocolate. Unless you want straight up vanilla. That works too. Blend ingredients together until slushy-like. Serve right away. Most of the ingredients in the list are in “give or take” proportions. You’ll figure this out if you actually try to measure 2 cups of ice cubes. Rectangle shaped ice cubes don’t cooperate very well in a round measuring cup. In addition, you may want your shake to be creamier, smoother, sweeter, chocolatier, or with coffee. Oh wait. This one doesn’t have coffee in it. Well anyway, feel free to add more or less of any of the above listed ingredients to make this shake just what you want it to be. What do you think? Which will you like better? And which will your family members like better? In our home, we have two coffee lovers, and to who think it’s bitter. My son and I don’t mind the other two not drinking it because, like you said, more for us. We’ll stick with your frappe recipe, but this one is great for the those who choose to miss out on the good stuff. :) Thanks for the recipe! Stevia upsets my stomach, so I used 1 banana (frozen) in place of half the ice cubes. I do like a very dark chocolatey flavor, so use more banana if you prefer a sweeter taste. Your posts always cheer me up! You are so funny! I’ve been making this lately with a scoop of peanut butter. Yum! !